Knife boxes were necessities for a well-appointed dining room. At Mount Vernon, George Washington’s Virginia estate, tours of the house begin in the elegant New Room. (Completed in 1787, it’s “new” in relation to the rest of the house.) The neoclassical, gallery-style reception room is formal, yet comfortable, with personalized touches that symbolize Washington’s agricultural interests, such as plasterwork depictions of farm implements and crops on the walls and ceiling. Large windows on three sides flood the room with light and allow cross-ventilation. The brilliant turquoise walls reflect the décor of the late 18th century. The New Room is where the former president and his wife would meet and entertain guests. It’s also where they hosted larger dinner parties, which explains the beautiful mahogany knife boxes prominently displayed on the sideboard. The Mount Vernon household inventory conducted after Washington’s death included eight “knife cases” that would have been similar to the ones in the Mount Vernon collection today. Some must have held Washington’s prized silverware with Chinese porcelain handles—handles facing upward. One is a pair of English mahogany boxes that came from a home in Charleston, South Carolina. They have the characteristic hinged, sloped lids that make traditional English knife boxes easy to recognize, silverplated escutcheons and pulls, a curved “serpentine” front and beaded edges. Finely crafted, they were intended to be displayed and would have been made by a cabinetmaker who also produced furniture for well-to-do households. 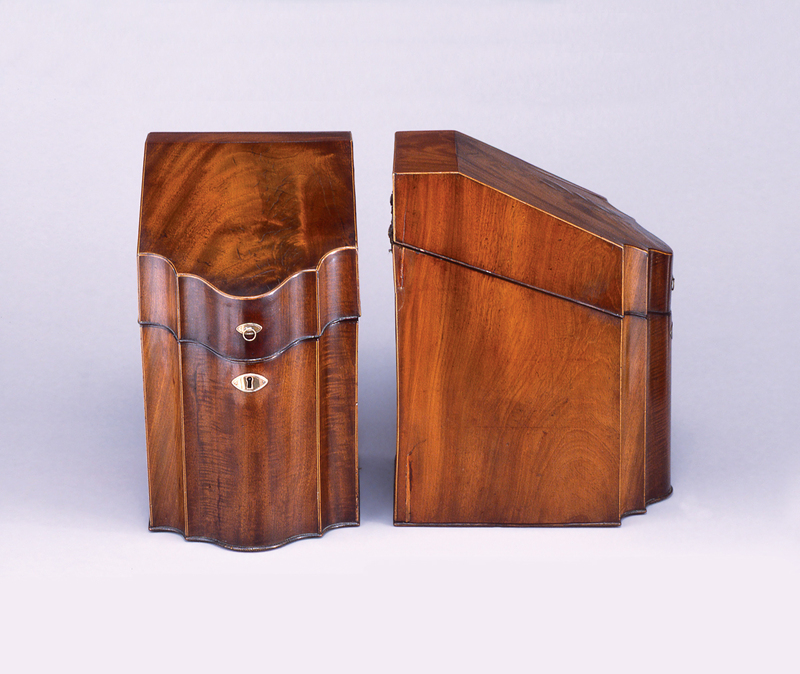 Both Thomas Sheraton and George Hepplewhite, notable English cabinetmakers of the 18th century, included slope-lidded knife boxes in their pattern books. They were that important to the furnishing of a well-appointed home. 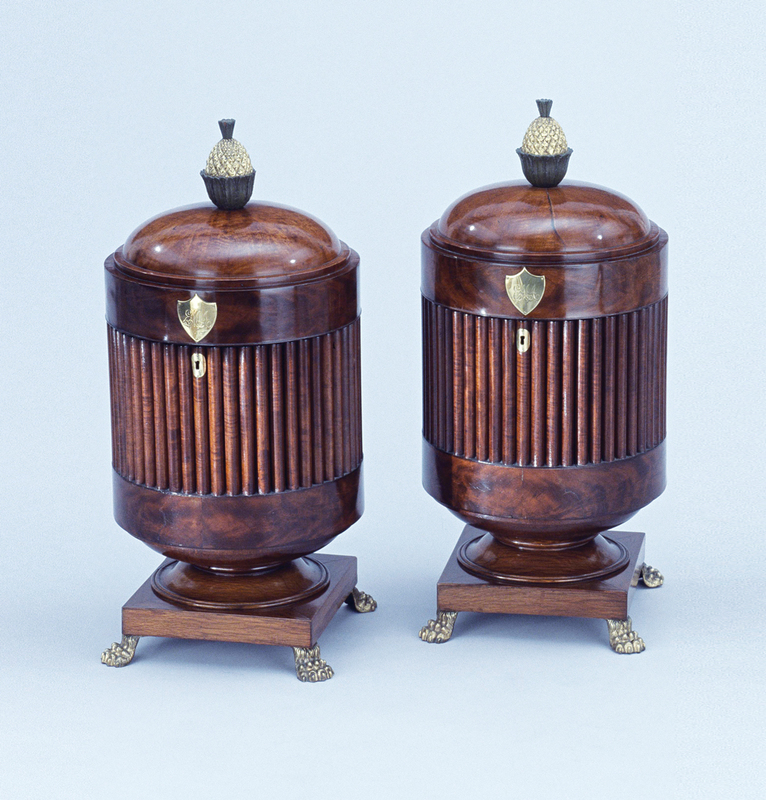 The second is a pair of American-made knife urns, or “butler’s urns.” If you didn’t know what they contained, you’d simply see them as skillfully turned and decorated wood objects and, maybe, wonder why they’d be placed on a sideboard in the dining room. But lift the lid—or in this case, the gilded pineapple finial—and all is revealed: the body of the urn contains circular tiers with slots for silverware. This neoclassical design also originated in England and became a favorite of Baltimore cabinetmakers. 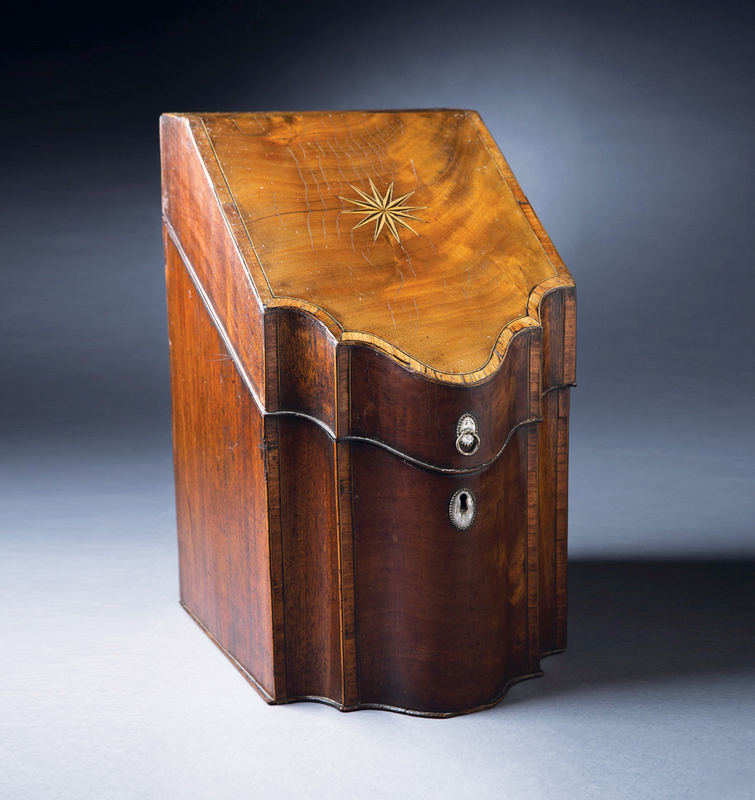 Like the sideboards on which they stood, most knife boxes were made from mahogany or from less-expensive wood covered with mahogany veneer that was polished to a reflective sheen. 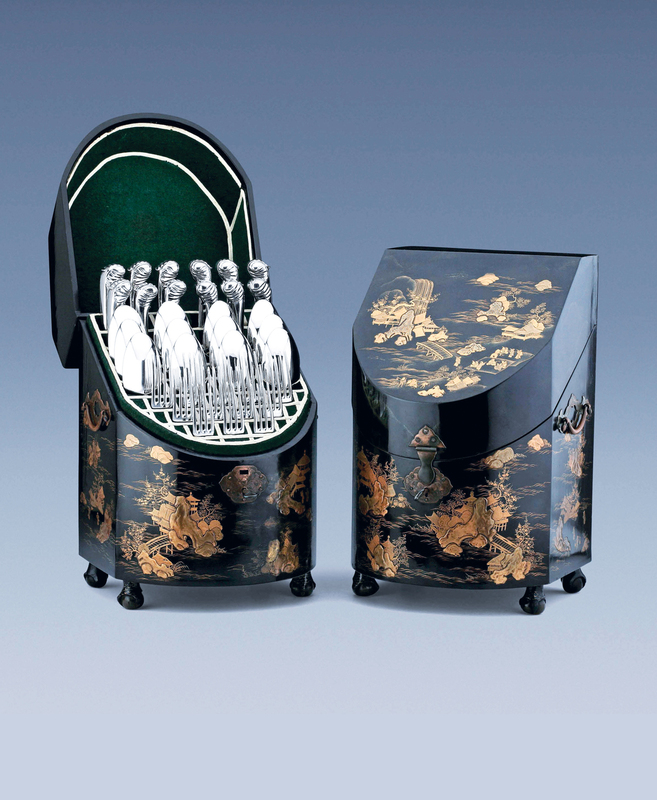 While the furniture and the knife boxes weren’t necessarily made by the same craftsman at the same time, decoration, inlays and embellishments on some knife boxes echoed the decoration of the sideboard. In other instances, such as the pair of lacquered knife boxes recently offered for sale by Dutch antiques dealer A. Aardewerk Antiquair, they were meant to be art objects in their own right. Most of the knife boxes found in American homes of the 18th century were made in England, where workshops were equipped to turn out small objects in quantity. Yet a handful of American cabinetmakers are known to have made knife boxes, and some even did this specialized work as subcontractors to larger firms. You’re unlikely to have a knife box in active use today unless you happen to be lucky enough to own a full antique silver service and to have a household staff prepared to set your table with it. Nevertheless, knife boxes often come up for sale and at auction and can be appealing objects to own and display. They might have been made to serve a specific purpose, now obsolete, but their beauty and charm is timeless. “A Rich and Varied Culture: The Material World of the Early South” is a featured exhibition at the DeWitt Wallace Museum of Decorative Arts at Colonial Williamsburg highlighting art and antiques that were created in or imported to the Chesapeake, the Carolina Lowcountry and the Backcountry between 1670 and 1840. For information about Colonial Williamsburg and its museums, visit history.org.